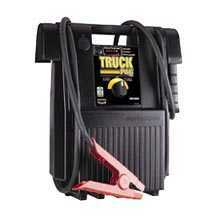 Auto shops as well as individuals for years have known about the benefits of the Booster Pac Jump Starters. They have tremendous power, features and quality. They have set the standard for commercial quality booster packs for many years. We could tell you about the quality of the construction, starting with the case, which was made to last with a thick and durable plastic shell. We could tell you about the thick, heavy gauge welding cables that stay flexible even in cold weather. We could tell you about the heavy duty clamps that will last for a long time and cut through corrosion on battery terminals. We could tell you about the one year warranty. We could tell you about the battery status gauge that indicates the state of charge of the battery. We could also tell you about the Clore Pro-Former battery, which is the best in the industry and manufactured for years of reliable starts. After all of these points, what reason could you have not to get one? Price? Don’t worry about that. These are some of the most affordable commercial quality Battery Booster on the market.You can also check out the owner’s manual.